El Best Western Emporia se encuentra en el centro de Emporia. Venga y disfrute de las mejores atracciónes turísticas cerca de nuestro hotel. Precios bajos garantizados y ofertas exclusivas. Este encantador hotel de Emporia, Virginia, ofrece un desayuno continental gratuito y cómodo acceso a muchos lugares históricos locales. Con una estratégica ubicación a la salida de la carretera interestatal 95 de Virginia, el BEST WESTERN Emporia ofrece las completas instalaciones, el cordial servicio de atención al cliente y las tarifas razonables que los huéspedes puede esperar de la cadena BEST WESTERN. Este hotel de Emporia ofrece también acceso conveniente a las tiendas locales, golf y pesca. Las completas habitaciones disponen de microondas, nevera, televisión por cable vía satélite con HBO® y acceso a Internet de alta velocidad. Empiece el día con un desayuno continental gratuito cada mañana. El BEST WESTERN Emporia también cuenta con una piscina al aire libre de temporada, un gimnasio y algunos servicios de negocios. Se admiten mascotas. El hotel está situado justo a 32 kilómetros del Lago Gaston que ofrece una variedad de actividades al aire libre y acuáticas. Haga una rápida excursión de un día al histórico Williamsburg o pase el día en la playa de Virginia. Este hotel BEST WESTERN también proporciona un cómodo acceso a la frontera con el estado de Carolina del Norte, situada a solamente 18 kilómetros de distancia, para todos aquellos huéspedes que deseen descubrir las atracciones cercanas. Haga su reserva hoy mismo y ahorre en el Best Western® EmporiaDisfrute de su estancia en nuestro hotel. "Cleanliness is not a priority"
Stayed one night on the way from Florida to Kingston. While realizing this is a "budget" hotel, still expect the rooms to be clean. The shower stall had black marks - possibly mold, and the overall room condition was old and tired. I'm sorry you had a bad experience while staying with us. Your feedback is important to us and is always welcome. I will pass your comments on to housekeeping and maintenance. I do hope that you will give us another chance. We would love the opportunity to make it right and show you we can do better. Thanks again for taking the time to write a review and for staying with us. 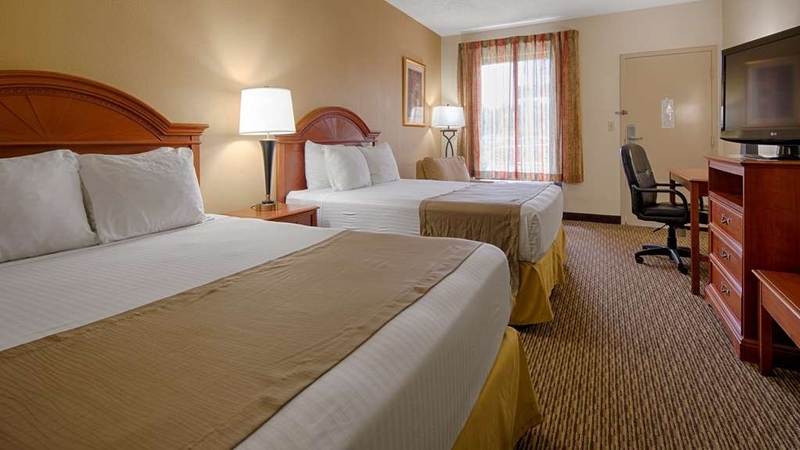 For the traveler going from Florida to Northeast U.S. on I-95, a good overnight stay is the Best Western in Emporia, VA. It's clean and accessible with good service. 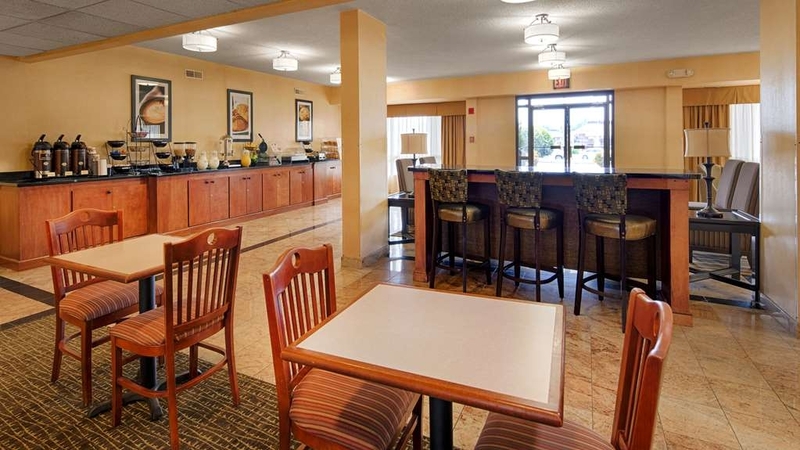 A free breakfast—eggs, cereal, fruit, waffles, toast, yogurt—is included in room fee. Thank you so much and glad you enjoyed your stay. Selected this property because of reasonable price and pet policy. Big mistake. Although the staff was friendly and the breakfast decent, the site needs a substantial cleaning and refurbishing. Our room was quite dirty. All around the edge of the room dust was caked on the carpet. The carpet felt grimy to the touch. The bathroom floor was sticky with little spots like urine splashes and there was mold on the bathroom ceiling. The towels were dingy and worn and the bed linens were uncomfortable as was the bed. The closet door was broken so the closet could not be used. The parking lot was full of mud so it was impossible to not track it into the room or car. It's too bad because the room could be nice. It's large and nicely designed. Hopefully management will realize the shortcomings and deep clean the place soon. Thank you for taking time to write a review. We try hard every day to make our guests happy. I'm sorry you did not enjoy your time with us. Your comments help us improve. I will be speaking to housekeeping and maintenance about your issues. I do hope you would reconsider and give us another chance. If I can be of any further assistance please reach out to me. Thank you again. "Clean bed for the weary traveler"
This hotel succeeds at the basic level - the bed was comfortable, it was easy to set the a/c unit, no excessive noise from the nearby highway. On the downside, the lighting is very dim - perhaps that was necessary in the incandescent lighting days but now with low energy choices it's annoying. Thank you for the review and pointing out the lighting. We always love feedback. Please come again. We stayed at the Best Western Emporia last night to break up our drive from Maine to Myrtle Beach. The hotel is right off I95 and there are restaurants and gas stations right there. The room was clean and the staff was friendly. A hot breakfast was included. Scrambled eggs, sausage, make-your-own waffles, assorted cereals, bread, and juices. The 11 AM checkout was a plus. We try as a rule to stay at Best Western Plus when travelling. We generally don't stay at this type of hotel( 2 story,enter from outside) but they passed the #1 test when travelling. A comfortable bed. After this everything becomes secondary. The breakfast was good. There was a good assortment of food and you can never go wrong with biscuits and gravy. Overall, it was a pleasant experience. In a pinch, We would stay here again. We stayed at the Best Western Emporia this past weekend during our scuba diving open water certification up at Lake Phoenix, VA. It's a less than 30-minute drive away, so it was pretty convenient. Our room was comfortable and I really appreciated the nice hot shower after freezing up at the lake. We enjoyed the breakfast with many options in the a.m. before we headed to the lake. The desk attendants and the breakfast assistants were all very pleasant. We would definitely stay here again if we are ever back in the area. "Great for large dogs and elderly parents!" This hotel has been doing renovations to their property. I had a renovated room that had a king size bed. What a great room. I rate the room 4.5 - would have been 5 if they could have increased the bathroom. Breakfast had hot eggs, bacon, sausage and pancakes besides ceral, coffee, etc.. Rated this 5. The staff was friendly and professional. Price was outstanding. Highly recommend. This is a nice place to stay with a very god breakfast buffet that starts at 6 am. My only and significant issue was that someone has obviously smoked in the room the smell was strong enough to make my eyes water. good place to stay, good rates. right at the connection from the bridge-tunnel to I-95. near interstate, places to eat nearby. nice rooms, good breakfast & used computer that worked well. We have stayed here before and it works well for us. Thank you for staying with us. I'm glad you enjoyed your stay but not sure of the overall score of 1. I do hope you will return again someday soon. "Good overnight stay with my two dogs"
I liked the stay for the most part. The smell of the room took some getting used to. I like that I can check in whenever and I wasn't limited to a specific time. What really irked was people knocking on the door twice during the last 15 minutes of the stay. First, I'm not from this area and I don't know you so I'm not too comfortable with opening the door at all. If they want to check if I'm leaving, they should communicate with the front desk and not worry me. That's not my job to let you know that. I'm sorry you had some issues during your stay. I do hope you will return again someday. "Great place for a quick overnight stay on the way to Florida"
Good hotel for a over night stop. Easy access off I95. Clean rooms comfortable beds. Good breakfast for a free start to the day. Lady working in the breakfast area was very hospitable. Topping off your coffee from a fresh pot. Front desk staff were excellent quick and efficient. Good quality room for the price. Although not a new hotel, was well kept, staff were fantastic and the continental breakfast was excellent. We would definitely stay there again. We had everything we needed to make our stop enjoyable. This motel is overpriced. My husband and I sleep in a king bed at home so we paid $5 extra for the umm privilege. Desk staff was very nice and check in was easy. The area behind the front desk and beyond let's you know the place is in decline. The two stars are because of the stains on the carpet, the hideousness of the jacuzzi tub, they would have had to pay me to use. Bathroom around the toilet area flooring looked sketchy. With taxes the room was $100 bucks way too much. We'll pay the extra $20-30 bucks next time for Holiday Inn. I'm sorry you did not enjoy your stay with us and felt the room was overpriced. We are working every day to improve and your feedback helps us do that. Next time you are in the area contact me personally and I will insure you have a much better stay. Again, I apologize. Aftwer driving several hundred miles toward our destination it was A PLEASURE TO GET ACCOMODATIONS AT THE HOTEL. We stayed there several times in our travels so it was no suprise to us what to nexpect. A great value for the money. "Decent Stop on the Way South"
We stopped at the Best Western in Emporia on our way south New Year's day. The facility is not new, and is showing its age some, but the staff could not have been friendlier or more accommodating. The hot breakfast is about what you would expect for a roadside hotel, but the person attending it could not have been more helpful or friendlier. Brightened my day. Pet frindly. This hotel is not well-managed. The rooms are out-dated, peeling ceiling in the bathroom, lack of cleanliness in common areas: dog excrement on the stairwell. The attendant at breakfast was helpful, that's about all I can say on a positive note. We spent over $100. Should have been in the $50-60 range. I'm sorry you did not enjoy your stay with us. We work all the time to improve and your feedback helps us do that. I hope you will return someday and give us another chance. Just contact me personally and I will ensure your stay is a better one. "Not as good as Motel Six or other similar motels"
My wife and I stopped heading south and were VERY disappointed in the motel. Rooms accessed from the outside. Very dirty outside. Room was not dirty, but not clean, either. Bathroom floor tiles messy where they hit the walls...caulking not complete. Ceiling in bathroom spotted with mold. Reminds me of the cheapest motels in the past when we didn't want to pay much. Will not make this mistake again. 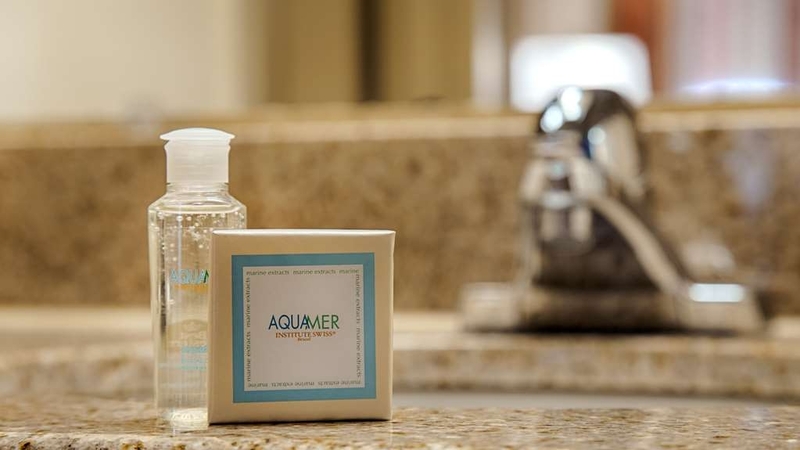 Pay the money for an upgrade to Hampton Inn or similar, or choose another "off brand". I'm sorry you did not enjoy your stay with us. We always love feedback because it tells us where we can improve. I do hope you will change your mind and give us another chance in the future. Just reach out to me personally and I will make sure you have a better stay. 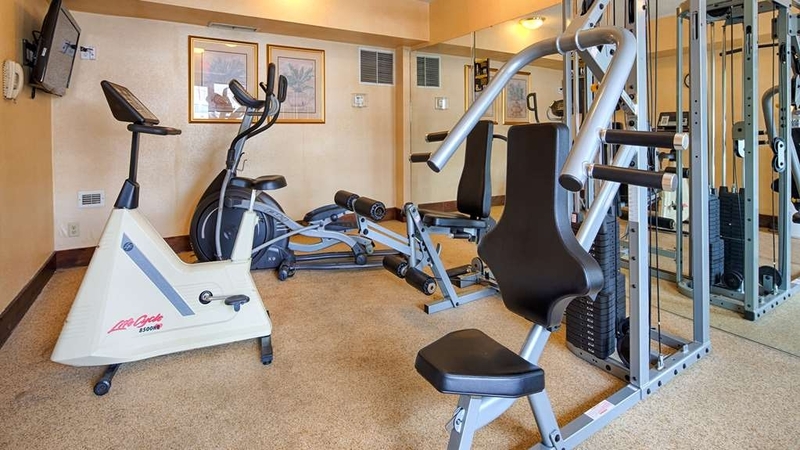 Clean rooms, friendly staff and lots of choices for dining and shopping near by. This is a traditional outside entrance style hotel where you can back up to your room which is important for us with a limited mobility family member. Thank you so much for staying with us and the nice review!! "Good Enough For An Overnight Travel Stop"
PROS: The facility was in generally good condition. It looks to be solidly built: noise from above our ground-floor room was non-existent. The room's furnishings were mostly in good condition. The mattress was comfortable but not the best. There were some issues with the room – see below. The breakfast options were good. CONS: The lobby desk was unmanned when we arrived at about 4 PM. A handwritten note stated “Back soon”. We had to wait about 5 minutes. The middle-aged woman who checked us in was efficient but surly (note that the different woman who checked us out was very friendly and equally efficient). In response to my request for a room in the back (also made at the time of making the reservation) I was pretty much told that those rooms were only for paying guests (it happens that we were using our points for this particular stay). To be fair, our room fronting on U.S. 58 turned out to be pretty quiet anyway. The lockset on our door was in poor condition. It was very difficult to get it to lock and we were concerned, I think legitimately, that the lock could be easily overridden from the outside. We had no choice but to put all valuables back in their car when we went out for dinner. Also, the deadbolt was not functional. We had to rely on the interior security lock. For additional safety or warning, we also propped a piece of furniture against the door when we went to bed. With some reluctance, we decided that we did not want the hassle of changing rooms. The toilet required a deft touch with the trip lever to get it to stop running when re-filling. The bathroom in general is in need of maintenance or updating. The A/C had only two settings: 59 degrees and 70 degrees – obviously, one too cold and the other too warm. However, it otherwise worked effectively and was not too loud. COMMENTS: Others complain about the noise. We have stayed here a number of times over the years – ground floor, top floor, front, back. Maybe we've been lucky, but we have never had any undue problems with noise here. Although there is less road noise at the back, the back is where all the larger vehicles park and in our experience they make more noise in their comings and goings (often very early AM) than does the highway. WRAP-UP: It happens that Emporia works well for us for an overnight travel stop. This is not at all our best Best Western experience but we still think that it is the price/performance choice for Emporia. "Very reasonable, good location and quiet"
We stopped here for an overnight on our way to Georgia. This hotel was clean and quiet. Nothing fancy. The staff was friendly and helpful. The breakfast in the morning was well stocked, there was a nice variety. You access your rooms from the outside, and there are plenty of spaces in front of the rooms for easy unloading. I was very pleased and would stay here again. Thank you so much for staying with us and the nice review!! Looking forward to next time. This place is the worst BW we've stayed at! No one swimming in this green pool full of algae, that should have been enough for us to select another hotel! (But we werent planning in swimming anyway) No Elevators, outdoor Motel with very loud traffic noise all night (bring earplugs). The front door was impossible to open. Housekeeping did a nice job cleaning our rooms, but our room smelled awful, like mold (& hunting dogs were in several rooms). There were also spiders in bathroom & bugs on floors. This place needs a serious remodel. Beds werent comfortable (no pillowtops here) & AC runs awful (looks like its 50yrs old). Thank you for your review. I'm sorry you did not enjoy your stay with us. I wish you had reported to us your issues so that we could have tried to make your stay more comfortable. Our pool is closed for the season so its not accessible to the guests and we do allow pets. I do hope that you will return someday and give us another chance. Just contact me personally and I'll do everything I can to make your stay a better one. "took over 700 for charges that I did not authorize"
I stayed here recently and was charged over $700 in charges that I did not authorize or was aware of until I looked at my bank statement. When I went to the bank to check with them the 700 had already cleared. I put the bank on the phone with the front desk manager who argued and said that they could not see where I had been charged that much and that it had to be the banks fault. When my banker told her that they charged my card and it had already cleared she still argued. I travel for work and have never had a problem like this. I am filing a dispute and will also be in touch with the better business bureau. Thank you for staying with us. I apologize for the confusion with your credit card. I'm glad we were able to clear up the issue. I do hope you will return again. First stop on long trip to Florida. Very tired. Had booked 2 rooms in advance. Pros: Good location for both food and gas. Cons: Unfriendly check in staff. No elevator. Soaked carpet in ground floor room. Yellow water in toilet (NOT URINE). Very poor flush power. Lumpy bed. Small lumpy pillows. Do not recommend. Thank you for taking the time to write a review. I'm sorry you did not enjoy your stay with us. Your feedback is always appreciated and helps us to improve. I hope you will return again and give us another chance. "Been to worse and been to better"
The front desk and breakfast staff were polite and helpful. Was a little disappointed in the pool as my kids had been waiting to get in all day and they got in for about 5 minutes, but said it was dirty so they didn't want to stay in any longer. It had rained earlier in the day and one side of the pool couldn't even walk by as the rain water wouldn't drain. Only place to sit with an umbrella that wasn't in the wet zone had beer cans and other trash under the table. Also the phones were down and were told they wouldn't be back up during our stay. As for sleep the bed was comfortable, once the pool emptied out it was much quieter. Do be aware this is an outside motel where you walk up the stairs and you can here people talking and walking bye so if a light sleeper bring ear plugs. Thank you for staying with us and the review. I hope you will stay again with us soon. Pleasant place to stay. We did not have any significant problems. The bed was comfortable. The area seemed to be quiet. Kids were enjoying the outdoor pool. There were several places to eat nearby, mostly fast food type places. Evidently the internet password changes at midnight the first of the month so we had no service the next morning. It would have been nice to know that ahead of time. Thank you for staying with us and the review. Thank you for staying with us and the nice review!! Arrived after 11pm and lobby was locked. Check-in was done via walk up window which made it difficult to hear. Staff indicated room was on first floor but not at what part of the building. Outside room entrances with no directional signs. It took 10 minutes to find the room. A cockroach the size of a quarter greeted us which my husband had to kill. Reservation was for 4 and non-smoking but only 3 towels were supplied and room was smoking. Rooms were not as shown on website. Fire alarm in room went off at 2am. Desk did send someone to change the batteries. Breakfast the next day was good which brightened the stay a bit. I would not stay there again. I apologize again for the inconveniences during your stay. We work hard every day to make our guests happy and I'm sorry you weren't. I hope you will give us another chance in the future.. Just call us directly and we will make sure you are booked in the correct room and that you will have a much better stay. "Overnight stay to North Myrtle Beach"
this was a great overnight stay on our way to our weeks vacation from PA to North Myrtle Beach. easy on and off to Rt. 95, and clean and easy to deal with folks, plus complimentary breakfast so you can get on the road to your next destination. Thank you!!!! Hope you had a great vacation!! Outstanding Best Western facility -- far superior to many others in all categories. Would definitely return here. Great service -- room was well maintained and cleaned. Very good Breakfast -- lots of choices and very good quality and service. Traveling down south with family (including four-legged member) we stayed at the Best Western based upon prior reviews. In the first room the toilet overflowed feces and water flooded the room. After given another room the dissatisfaction continued... hair in the shower stall, moldy smell in the bathroom, filthy carpet with dirt and thick dust in every corner. Room infested with gnats, black bug on wall near bed and in bathroom. (Not sure what it was, but it was the size of a roach.) Will not come back. I do not mind old, but dirty is unacceptable. The only positive, was that we were given a pet credit and the hotel had a very accommodating front desk and breakfast staff. Thank you for staying with us. I apologize again for the inconveniences experienced during your stay. I do hope you will return someday and give us another chance. Please feel free to contact me at 4346343200 and I will personally ensure you have a better experience. Got off I-95 at 10:00 pm, and needed two adjoining rooms. They easily accommodated us at a fair price. The rooms were clean with comfortable beds and pillows. Breakfast was pretty typical how ever the lady taking care was exceptionally nice, as was the checkout. We booked this hotel last minute. The location of the hotel is close to I-95, The Check in process was quick but not friendly. The room door did not close tightly, the bedskirt was stained and the chair, although comfortable was faded/discolored. 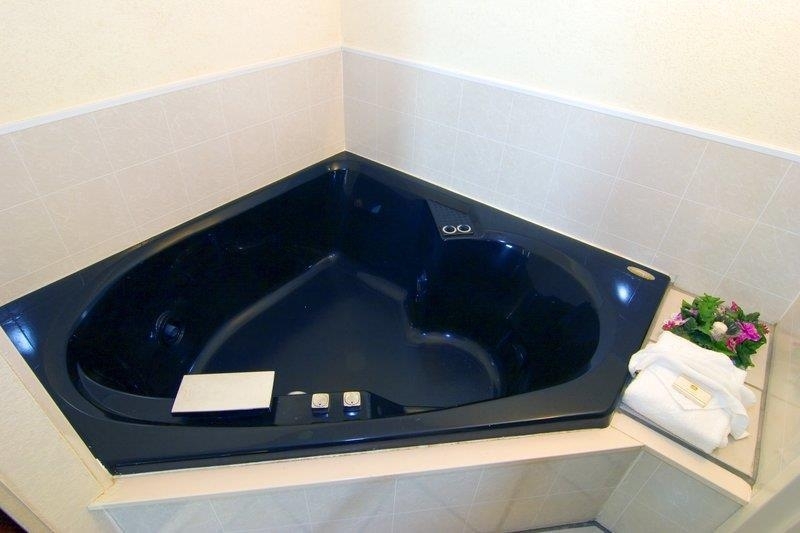 An odd item in the room was a black porcelain jacuzzi. The bed was comfortable and the facilities worked (although the air conditioner was noisier than some we have experienced). In my opinion, the place needs care or renovation. The bright spots were the checkout clerk and breakfast bar attendant who were capable, friendly and professional. Thank you for staying with us and taking the time to write a review. We are always looking to improve and your feedback helps us do that. I apologize that everything was not as it should be and I will be forwarding your review to housekeeping and maintenance. I hope that you will return and give us another chance someday. I like traditional motels with external corridors, and this Best Western, across the far side of the freeway from the town seemed just what I liked. I walked in, the receptionist looked at me, turned away and shuffled a pile of papers. I waited. "Excuse me?" I said. She turned round sharply, "Yes?" "I'm looking for a room for the night." "We don't have any left on the first floor" she said, sharply, and turned back to her papers. So, I thought, I'm not wanted, and walked out. Thank you for your review. I'm sorry our front desk agent was not welcoming to you. I'm also sorry that you did not stay with us. Your feedback helps us to improve so thank you for that. I do hope that if you are in town again that you will give us another chance. "good hotel for an overnight with pets"
we stay here on our drive from NY to FL - we have a dog so we need a pet friendly hotel - this one completely fits our needs - very friendly staff, clean rooms and breakfast - our only complaint is that the pillows are small and square! Thank you for staying with us and your feedback!! I was traveling north and needed a place for the night near the I-95 highway. This was just right. Plenty of convenient places in the area for gasoline or whatever, but not a really good selection of restaurants around. Thank you for staying with us and taking the time to write a review. I hope to see you next time you are in the area. This motel features a great location,very comfortable beds, friendly service, and one of the best complimentary breakfasts I've ever had at any motel. We would definitely consider staying here again if in this area. Easy access on and off I-95. First floor rooms available and there's a large field within 100 yards of the hotel that's perfect for dog walking and exercise. The staff is so friendly and the rooms are basic but nice. "Best Western not the Best." Arrived about 6:30 pm on Saturday on the way back to Florida. Check-In was easy enough. Front-desk clerk waved off my offering of driver's license and credit card I had on file. Must've been my sweet face. No ice in our floor's ice machine-had to go down to ground floor. Beds touted as queen-sized were not... only doubles. Would've opted for single king if I'd known but at least the doubles were clean and comfortable. Breakfast next morning was the usual fare-waffles, eggs and some sort of potato casserole. Eggs were watery but everything else okay. Breakfast attendant had a tip basket out-something I've never seen before nor did I oblige by contributing. Best Western needs to take a look at this practice. Check-out was smooth making for a fair stay overall. "Convenient and friendly highway stop"
I usually always select Best Western for my one night stays. The value and service are normally consistent. This was an eye opener. Small in-room issues like pillow quality and A/C noise, small bathroom and overall appearance were noted. I don't like the addition of $10 fee to see if I incurred any additional costs from my original room rate that they say will be returned once they clean the room. I am not a rock band. Thank you for staying with us. The $10 is not a cleaning deposit it's just to make sure your credit card is valid. Very similar to going to a gas station and they authorize your card for $1. I do hope this will not keep you from returning. Thanks again for staying with us. We stayed here one night on our way to Florida.This motel is reasonably priced. Very clean. Convenient location. Rooms very roomy. I highly recommend this Best Western if you are traveling, north or south. Right off Interstate 95. Also free breakfast very good and enjoyable. "Poor quality of room and breakfast"
Poor quality of room, light did not work and front desk did nothing. They said that there was no maintenance person on the premises. I had to move some lamps into the bathroom area in order to see. There was urine stains around the floor of the toilet. Fruit in breakfast was rotten. Thank you for your review. I apologize again for you inconvenience. We work hard everyday to improve and your reviews help us do that. It is my sincere hope that you will return again and give us another chance. Once again, I apologize. Moving to fl BW rewards members. Very satisfied with everything. Thanks for a wonderful stay. Good breakfast good room and great staff. Would stay here again. I recommend Best Western to all of my friends. "Best Western - Best Value"
We have been regulars at Best Western Hotels for years, and they never fail to deliver for us. We travel with a pet, and my wife has mobility issues; Mary, our concierge made special arrangements for a 1st floor room. Not unexpected, but appreciated nonetheless. Thanks Mary - you're our employee of the month for sure! Thanks for staying with us and I'm glad Mary took good care of you. Looking forward to your return. Great place to stay with a pet. The beds were very comfortable, and the staff was helpful. My only concern was that I prefer hotels with inside entrances to the rooms, but I didn't feel at all unsafe here. There were a lot of construction workers staying here. There were fast food options nearby. I will stay again. Thanks for staying with us and the review! As with all Best Western hotels we have stayed at, clean, convenient and inexpensive. All the staff were friendly and very helpful, and of prime importance to us, the hotel is pet friendly. Personal preference - when travelling with dogs - I would prefer a room that is not carpeted - wood, laminate or vinyl would be better - more hygienic! Stayed here on our way back from Florida to NY. Bed was comfortable, room was clean but a little dated. Hotel is pet friendly and we were able to get the bottom floor and park in front of our room which was easy with pets and luggage. Down the road a 1/2 a mile there is an Applebee's which is open until 12:30 am if you need a late night option for food. Easy on off to I-95 and beds are comfortable. We would stay there again for a night when traveling back and forth to FL and NY. The location is great - right off I95 BUT that could be an issue if you're a light sleeper - constant truck noise. Mary at the front desk is very nice and helpful. I needed her help because there was no shampoo in the room. She provided me with some. The room is nice. The only amenity lacking was a USB port so I was unable to charge my GPS whose battery had drained. It was extremely cold - 10 degrees and the heating unit wasn't plugged in. There are plenty of eateries right nearby. Stop at a rest area on the way down and look for a booklet with a discount coupon that gives you a better rate than any other you could get. If your are looking for new or modern decor I would not recommend. However, it was clean, friendly, allowed pets for a fee, it was right of highway and they had a Great breakfast with helpful staff. They had everything that we needed. "Halfway point Maine to Florida"
Good value and convenient location. Hotel is near mantic and plan to again.y fast food restaurants and access to gas station and convenience stores. A perfect layover location. This is a pet friendly hotel and the add on cost for pets is reasonable. Have stayed here twice before and plan to again. We pre-booked a room which is handicapped accessible on our trip driving from New England to Florida. After nine hours of driving we are exhausted and needed our room and bed desperately. The room is comfortable with a king size bed, a huge bathroom a walk-in shower, a handicapped toilet, large TV, blow dryer, frige, coffee and pot, just so comfortable for two tired people. A good experience at this hotel. Front desk staff was friendly and professional. Room was clean and comfortable. Room furniture in this hotel is a bit dated, but not off-putting. Bed was comfortable. Wi-fi worked well. The heater worked very well (important because the temperature had dipped to 20 degrees the night we stayed there). Our only issue was a broken coffee maker, which we took to the front desk and they kindly replaced, after being super apologetic about it not working. Couldn't have been nicer! Smoking rooms are available at this hotel. This is also a pet friendly hotel -- good to know the next time when we travel with our dog. Great location near I 95 over the Virginia border As well as restaurants and assorted gas station. Also, very pet friendly, breakfast is good. Shopping available in the area. Gas prices are a little high. "Part of a chain where you have exceptional value"
This BW was noisy and not as up to date with room but average. Staff was pleasant and breakfast was hot or cold choices. Easy on and off intersatate 95 . We will use Best Western again when we travel. This is a comfortable hotel about mid way between New England and Florida. If you want to travel two days either way this is the place to stay. It used to take 21/2 days before I stayed here. Value is good and so is the breakfast. "Be Very Careful When Using the Internet"
When I searched on the internet for the phone number to make a reservation at this hotel, I was led, unknowingly, to a Priceline number for, "Best Western" I wound up, not only paying more than if I had phoned the hotel directly, but also had to pay in advance. "Horrible Bed. Everything else was great." Bed was hard as a rock. Got in late, did not request a new room as I didn't know the bed was uncomfortable until I was ready to go to sleep. If I new earlier I would have changed roims. Room was clean, bathroom was clean, shower worked. "Some problems, but it works"
The hotel certainly served its purpose, BUT, I could hardly get the door open, had to really push it in, the hair dryer didn't work, the access to the rooms was inconvenient. But the rooms were clean and nice, other amenities in room were great. Breakfast food was fantastic. It certainly serves the purpose when just stopping over on a long drive. excellent service best waffles in town. clean comfortable room. cable tv and internet at no charge. near restaurants and stores. Needed some last minute items and I was only minutes away from a Walmart. Room was comfortable. Staff was very pleasant & helpful. Cleanliness of room was just ok. Should pay more attention to the bathroom. Location was good as we were traveling south on I95 & motel was just minutes away from the exit. The hotel is a very good Best Western. Rooms were clean and very comfortable. My room was very quiet which was important as we were traveling thru from Florida to NY. Breakfast was the usual Best Western fare. The only knock on the place was that the bathrooms were dated and the shower head was broken but worked. "Ok stay for a night." I needed a place to stay for one night, pet friendly,while travelling south down I95. Id chosen BW ahead of time due to my good past experience with BW. Checkin was a breeze, room was right off the parking lot as Id asked. The decor for the room was dated, as if I was in a 2 star hotel, but it was clean! Wifi works but its slow. After a good nights sleep I went to check out at 05:30 but the lobby was locked and nobody at the window to take my key. So much for a check out experience. All in all an ok stay, and I would stay again, although a bit pricey for the type of room ($100 with a pet). We stop here once a year, about the same time every year and each time we have seen the same staff. The rooms are clean and comfortable and we recommend this place to friends who are driving through this area. "Not up to BW usual quality." Room a/c didn't cool - just fan working. Scratchy bottom sheet on a hard mattress (a fluffy mattress cover would help) The best thing is the extremely attentive breakfast lady. She is wonderful. The best we have seen at any hotel. We excepted more from Best Western than a very humid room with a weird smell. Bathroom is a bit rusty and I hate when the sink is on the outside of the bathroom! Good thing the beds were comfortable and clean and breakfast was enjoyable. Clean ourside and very easy from the highway to get to hotel. Lady at desk was so very kind, helpful and overall nice. Room was nice, clean, bed very comfortable. Interbet little slow but good overall. Everything worked properly in room and quiet overall. I will be bacl soon and enjoyed my stay. When we pulled up to the hotel, wasn't sure I wanted to stay here at the Best Western in Emporia. The clerk at the Reservation Desk was unfriendly. At first she told us she had 1 room with a king bed on 2nd floor, then she had 2 doubles on the first floor. No elevator. She gave us a room on the first floor right by the pool which was very noisy. The AC was not working, so she transferred us to another room. All of a sudden, these rooms became available. We only were staying 1 night as we were driving down south, so we stayed. Staff polite and helpful, but building is a little shabby and fixtures in room were somewhat worn. Closet door would not open so I could not hang my clothing. The sink's faucet handle was so loose it nearly came off in my hands. The room's carpet felt somewhat sticky. I apologize again for the lack of room service during your stay. We are always looking to improve and your feedback helps us do that. I do hope you will stay again and give us another chance to serve you. Nothing good to say except it is a convenient location. Outlets didn't work and were cracked and not secure. Definitely fire hazard. Front desk said nothing when I complained. Room was very musty and was old. Thank you for the review. I'm sorry about the issues you encountered during your stay. I hope you will return again and give us another chance. "Rest stop on the way to the beach"
Glad you enjoyed your stay. I hope you will return again. "Great value for roadside rest!" I was on my way to the beach and needed a rest stop free of the DC/Richmond traffic. 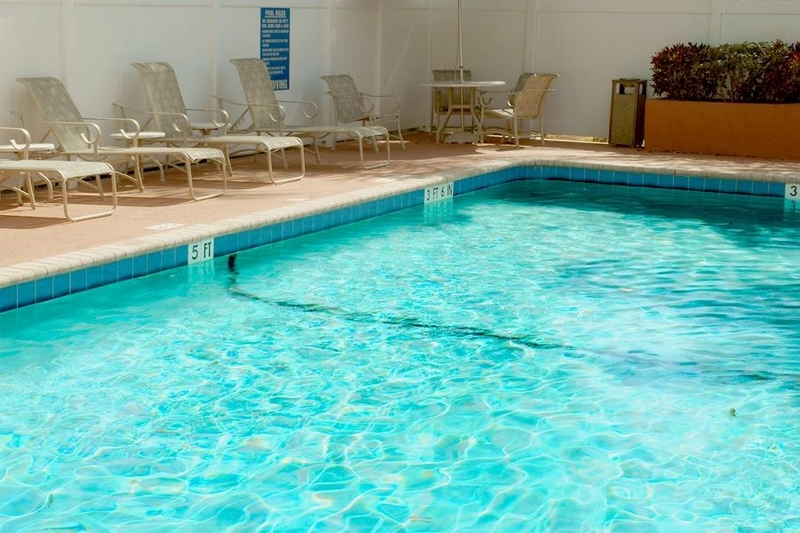 The location of this motel is perfect, close to the highway and in a low traffic part of 95. The rooms are clean and has a decent free breakfast. I found the value to be above what the ratings reflect and would absolutely stay here again. The hotel is easy to find just off the I-95 and has a nice exterior look. 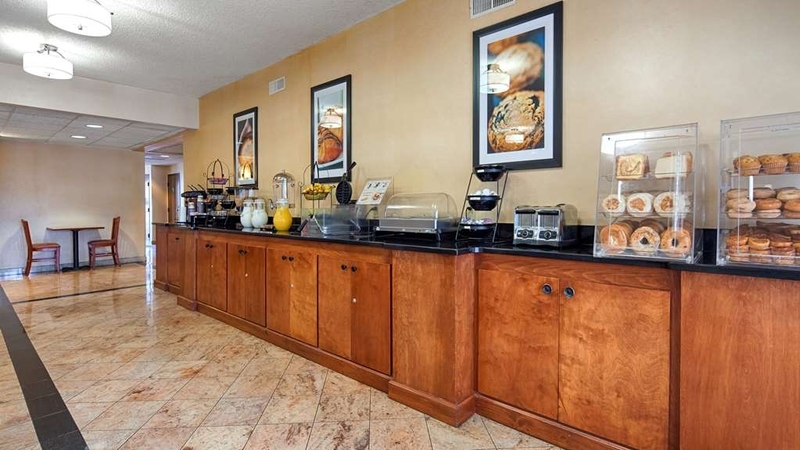 The reception area is large and very clean with the breakfast bar to your right. The rooms are very clean and the decor was dated but not shabby. The shower worked well and powerful. Location is within walking distance of a couple of good food outlets. The bed was a let down, but overall a very pleasant stay. The breakfast was outstanding. The food was hot tasted great and there was plenty of it, for seconds! This is a horrible place to stay overnight or a quarter of a night..Imagine falling asleep and waking up to a room full of furry mold all over the carpet & worst of all it had accumulated on the comforter we were sleeping under..unless you're intospores & penicillin magnified X's 3 this is not the hotel for you..I'm suprised this place hasn't been condemned..Traveler's BEWARE! !..there will be mold to greet you or say farwell to you on you're departure.. Thanks for the review. I'm sorry you had issues during your stay with us. I would like to speak to you about the problems you encountered during your stay. Please contact us at 434 634 3200 so we can discuss this further. We are always looking to improve and your feedback helps us do that. we were welcomed by a very nice check in clerk who recommended good food in the area. the room was clean and beds were comfortable. couldn't ask for more on a one night stay!! we found parking near our room and the area was quiet and well lit. "OK For A 1 Night Stay"
Front desk person was very nice and helpful. Room was right by the pool. A little noisy. Room was clean. Beds were horrible. The hardest I have ever slept on. TV was just OK. Wifi internet was pretty slow. Breakfast was also OK. Eggs and sausage, waffles and good coffee. I won't be staying there again for that price. Thanks for staying with us. I hope you will return again. When on a road trip, I always look for easy-on, easy-off hotels. Best Western Emporia is just that. My room was ready when I arrived at 2 pm. There are lots of fast food and sit-down restaurants within close proximity. Although the truck stop close by made it a bit noisy, the noise seemed to dissipate by midnight and started up again by 6 am. Requesting a room in the rear, might alleviate the noise factor. There was ample parking and the rooms were accessed by outside corridors. Front desk staff was friendly and helpful and the reception area inviting. The room was spacious, with carpeted floors, microwave and refrigerator and big screen television. The Wi-Fi was iffy and the room relatively clean. I considered the hotel to be adequate and competitively priced. Overall, no complaints. Thank you!!! I hope you will return again. We usually stay at Red Roof because of their generous pet policy. However, I booked the Best Western because it had better reviews. Mistake. The room was supposed to be non-smoking, but clearly there had been smokers in it previously. The worst was the sink was stopped up. How do you clean a room and not notice that the sink is not draining??? Called the front desk and was told that maintenance was gone for the day but we could come down and get a plunger. Hubby did & cleared the clog, but it was really disgusting. Sorry, but we will stay at the Red Roof on our next trip north. It really can't be any worse! And there will be no additional charge for our little dog. Thanks for taking the time to write a review. I apologize that you did not have a good experience during your stay with us. We work hard to make our guests happy and I'm sorry you were not. I do hope that you will give us another chance to serve you and show you we can make it right. Just contact me personally at 434-634-3200 in the future and I will make sure you are better taken care of. Nice room, good breakfast, nice pool, good staff. Good value for the money. Get a room on the back side of the hotel. Rooms on front side a little noisy from road noise. Not to far from a Walmart store. Thanks for staying with us and the review!!! Needed a pet friendly hotel close to RT 95 on our drive from FL to NH. This was by far the best hotel for that purpose that we have found. Close to highway, room was clean, beds were comfortable. We like the walk up to your door style as it was easier to bring the cat in. Breakfast was better than expected. I would recommend this to travelers who needs a nights sleep while traveling. Thank you for reviewing your stay and I'm looking forward to seeing you next time. 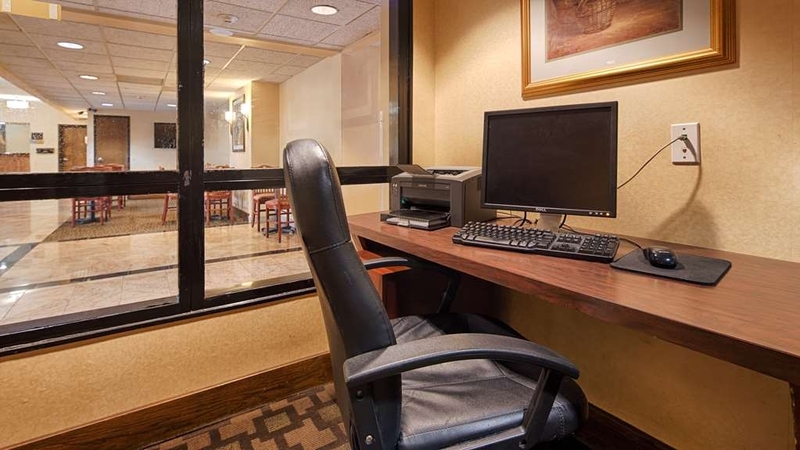 "Not what I have come to expect from Best Western"
Thanks for the review. We were having some issues getting the pool open but it is all fixed now. I hope you will return again so you can enjoy it. "Very nice to stay here while traveling." The hotel is very nice and clean and was very quiet at night. It was nice to have a frig and microwave in the room. Check in and out was fast and easy. Breakfast was great! Get up, eat, and be on your way! It was very easy to get off and back on I95. I've stayed at this hotel several times and It's s always friendly and clean. The carpets and chairs are start so see some wear and stains, but clean comfortable beds. Bathrooms are cleaner than most, not perfect, but definitely doable. As for breakfast, it's a warming experience, there is a nice selection of hot food, and the lady who oversees the breakfast room is absolutely delightful; she is eager to fill your coffee cup, get you juice or milk, make you a waffle, or get you anything else which you might want. Just a completely pleasant experience! as member of best western there are times when I am not able to preplan a reservation and have to "wing" a stay and I usually look for best western. with the experience had here on the car ride to new York, the return trip I avoided this best western. stay at Selma, NC last year much better hotel. Thanks for taking the time to write a review. I'm sorry to hear that you did not enjoy your stay with us. It is always our hope that you will return and give us another chance to serve you better. If you would like to please contact me directly at 434-634-3200 and I will ensure you have a better stay. We always stay here on our trips to the south. It is the perfect location for our first night's stay from Delaware to South Carolina. We always ask for the same room and generally get it (a handicapped room) for ease of parking and the maneuverability in the bathroom. I would recommend it for any Best Western fan. There are several motels in the area, but this is always our best choice. Excellent hotel, service and comfort. Great experience. We were traveling to South Carolina for a wedding and this stop over was perfect. We enjoyed the room and proximity to the highway. Easy access and booking experience was easy. Thanks for the review!! See you next time. Staff seemed pretty friendly. Hotel was clean for the most part. Rooms were decent. Linen on and around bed was not the best. Repairs needed to be made in the rooms including a leaking sink. Toilet not flushing properly. Horrible internet. Thanks for the review. I hope you will return so we can do it right for you next time. We were on our way home to Mass from South Carolina. Needed a place to stay for one night. This place was great. Conveniently off the highway, clean, friendly staff and a great breakfast. There are a few places to dine in the area. We chose Five guys. "All you can expect formv a motel"
We use Best Western all the time + always get our money worth. We always enjoy the breakfast as it save us time when we are traveling. Most of time they have a news paper. Most of the time the motels are close to the express way. The hotel needs updating and is over priced for what you get. It was very quiet. I had a pet friendly room and it was just okay. My dog could smell everything that had been there before. The breakfast was suffient. "On our way to Florida." Very clean nice, needs some updating.Toilet where very low..not good for people with bad knees. The staff was very friendly,and helpful. The breakfast was good and coffee was awesome . Good location,close to the off and on rapes. The hotel is in a good location. Easy off and easy back on to continue your trip.Check in was great. personnel very nice and helpful. Room was nice beside the outside pool which we did not use as was just in the process of being opened. Kind of cool to par take at this time. Nice pool through. Rooms very nice with microwave and frig. Beds very nice and supplied a great nights sleep. Breakfast was very good with a good selection of hot and cold food and drink. There are some dining places in the area and more about a half mile up the road. This hotel was a very nice stay. Room was clean, breakfast was good. Easy on/off from I-95. Only issue was fly and bug in the room. Front desk was concerned at check out and reduced room rate. They said they would ask their exterminator to pay special attention to the room. This motel is what it is and that's clean, convenient, efficient, and good value. For that it probably deserves 5 stars but it obviously is not competing in the 5 star category. It wins no awards for elegance or first class service. But it gets my vote because it took 5 minutes to get me checked into a decent, clean room that cost $75. Badabing! Great place to rest on your way North or South! Convenient and close to 95 and fast food close by! The staff was efficient and friendly, and the.breakfast was good! The breakfast lady was lovely and helpful. This hotel was a clean, comfortable stop off of I95 on our way home. The price for the two of us and our dogs was well under$100. This is a very basic place. It is no frills but safe. The room was pleasant but the toilet in the bathroom was a bit slow. "Price up - Quality down"
This hotel has been has gone from about 3-4 star down to 2 star over the past few years. Price is going up, quality going down. We've been staying there for 10 years on our trips to and from Florida. The price keeps rising and the quality keeps falling. The last few years there are always small nagging problems. Since we arrive later in the evening, we don't want to be bothered with service people, so we just put upwith it, FOR NOW!!! "This Best Western is Not on Par - Go Someplace Else"
We were tired after a long drive. First the tub would not hold water. I called the front office and maintenance couldn't be called. On closer look, the tub was dirty. The heating/AC wasn't working. The next morning, our bill noted a 10% discount. I asked for 50% and received it. The building needs an outside facelift. Thank you for taking the time to write a review. All the issues you pointed out to us were taken care of. I apologize again for not meeting your expectations. I do hope you will stay with us again and give us a chance to show we can do better. Looking forward to next time. Room was shabby. Exterior was poorly maintained. Room was noisy. Breakfast so so. Stayed on trip to summer home and did not like this place one bit. It appears that Best Western has increased their prices but lowered their quality. I will be finding another hotel company in the future. Thanks for taking the time to write a review. I apologize for not meeting your expectations. We work hard to improve everyday. I hope you will stay with us again and give us another chance to serve you. If I can be of further assistance please contact me at 434-634-3200. We appreciated the easy access to the Best Western off of I-95 after a long day on the road. It was nice to be able to park directly in front of our ground floor room, which was clean and comfortable and spacious enough for an overnight stay. We especially appreciated the lighting in the room which allowed for easy reading after dark. The bed and bedding made for a good night's sleep. The refrigerator was a welcome plus as were the microwave and coffee maker. In spite of the location near the highway, our room was quiet. We could walk to several choices of restaurants for a bite to eat and we chose the Five Guys hamburger place across the road. We were greeted in the morning by the neighborhood cat who seems to make a point of welcoming everyone as they pack their cars to leave. Breakfast was good and I was especially delighted to find a heart imprinted on my waffle when I took it out of the waffle-maker! Linda, in the breakfast room, was the most attentive attendant we have ever met in a motel! She made certain that everyone was well taken care of. Thanks for your review. I hope you will return again!! Always a great value with very clean rooms, a comfortable bed and with free Wi-Fi and breakfast included. Great location off of highway 95, with easy off and on access. Gas stations and restaurants nearby. Good location, but I am sorry to say that our room smelled bad and their was a big stain on the rug. I did not ask for a different room as I carry a portable air cleaner with us and it was next door to my sister's room. I would probably not stay here again. The Hotel was actually ( good ) it is the reception staff ( front desk ) that need customer service training. I did not get my e-mail confirmation, the morning after my stay I went to confirm my e-mail address because I need the Invoice sent. The reception confirmed it , I have had to call this Best Western to re-confirm my e-mail which really bothered them ... I only want an e-mail I am still waiting. during the call I clarified and confirmed my e-mail 3 times , what is it going to take ?? I'm sorry you are having an issue getting your receipt. I will certainly be glad to help you with that. Please give me a call at 434 634 3200 between the hours of 7-3. I hope you will return again. "Only if you're still tired you need a one night stay. " I was so tired. Had been driving for hours... all the lamp shades were very dirty.. the carpet needs redone. Sketchy area. Had a few places around to eat. Bathroom could have been redone. But it'll do for tonight. cleaner room, and the musky smell, remove stains off walls. The Gym was disgusting!!!! (filthy mirrors, stink, no air flow, extremely dirty mirrors, and pumpkin seeds spit all over the mirror and floor, cups everywhere. Just unbelievable. After staying in a BW in Lumberton NC (also a 2 diamond) that was wonderful, this was a letdown. The rooms were shabby and in dire need of refurbishing and it was $20 more! The king bed sagged in the middle, which did not lend itself to a decent night's sleep. The check-in clerk sauntered over to the counter from where she was sitting in the dining area texting. No greeting or smile, just a "Yeah?" I said we have a reservation and she said "name". Never a smile and when I made sure we were on the top floor, she said yep arournd the back of the building. We parked there and discovered we were on the side of the building meaning we had to repark the car to be closer to those stairs. The bathroom toilet tub area was smaller than an airplane bathroom. Very hard to get in and actually close the door. The room looked clean, but really shabby. The closet door did not open and there was no microwave which was supposed to be there. Breakfast was good, however, and the check out clerk was much nicer. Not a bad place for the night. However, the room was dark and carpet felt damp. The light over the sink was broken. Breakfast was good for a hotel breakfast. Easy access off I95. Shoney's across the street. Enjoyed our stay. Staff was great. We travel up and down the East coast twice a year and we are planning a trip to California and Hawaii. 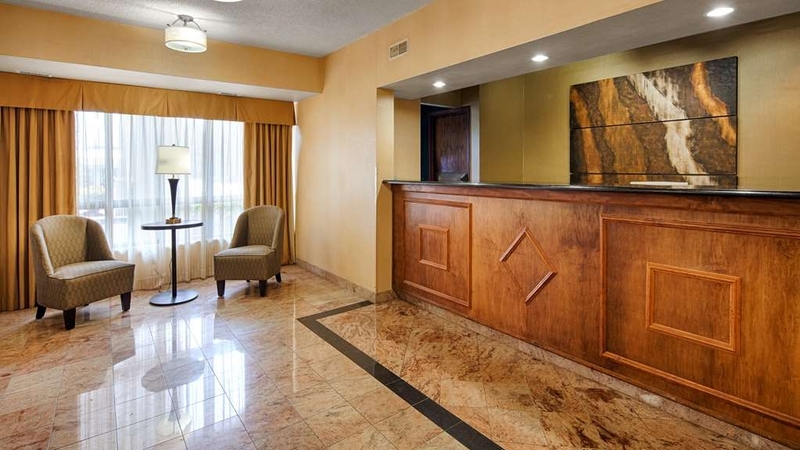 We do like to stay in Best Western hotels because we know they have a good value and are dependable. For the most part, they are clean and updated. We stayed here one night on our way to Williamsburg Va. It was a Very Good Motel, Clean, Good Firm Bed as both of us have Back problems. The Breakfast selection was only average, but the food was good. The motel is very easy to find. "Perfect location with plenty of restaurants to choose from"
We stayed over night and had a very nice stay. Bed was comfortable, AC was great, room was clean and it was quiet. Breakfast was great Lee Ann was very nice and helpful. We will come back when we can stay longer. Very happy with staff and stay. I can't complain about anything. 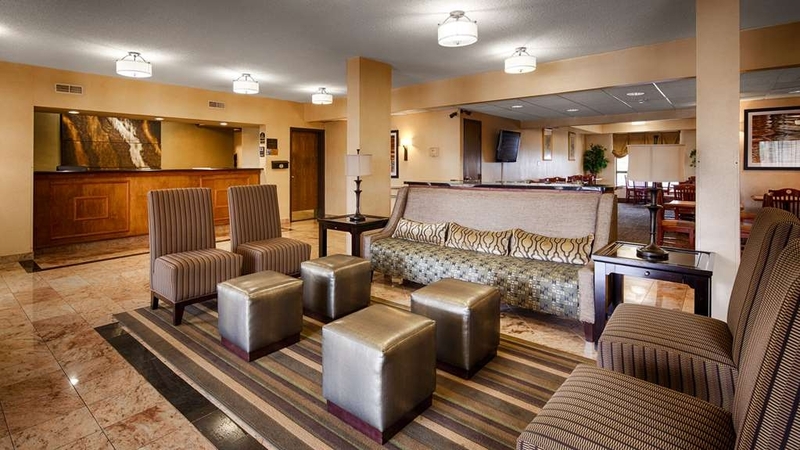 My experience at Best Western Emporia has always been great one. I had a very nice stay overall this last visit as I always do. Employees are great. The pool is nice. The rooms are always clean. Stopover for 1 night sleep. Arrived after 11 which meant had to check in the outdoor service window. However it went quick. Room was clean. Beds were comfortable. Pillows were small and lumpy. A/C was quiet and efficient. Shower was fine. Continental breakfast had everything needed. All in all a good place to stay for a night. "This Place is Falling Behind"
Spent one night here several years ago, it was OK. A budget choice, OK for people traveling north or south on I-95 who wanted a quick and inexpensive room for one night. On our recent visit we learned that this place has been going downhill. Rooms starting to look dumpy, the air conditioning machine in the room was working but it wheezes all night. The mold on the shower tiles was too much for my wife- she says never again. I hope for the hotel staff's sake the owners spend some money to fix this place up. Staff was great. Quality of the hotel rooms were bad. Our door barely shut and you could tell it was damaged. Carpet in the room was sticky and whatever it was on the carpet got on the bottom of my shoes. Room was poor quality especially for the price. First impression was not good. Arrived 12:30am and found the lobby doors locked. For security you register through a service window. It keeps the hotel staff safe but leaves you standing alone outside. Otherwise the hotel and staff were a good deal for the price. Nice comfortable room and great free breakfast. Bathroom could have been cleaned better as there were hairs in tub and on floor. Staff was very professional and efficient. Nice pool, too. Climate control was quiet and efficient. "Good location for one night stay." I chose this motel because of location and price, and got just what I expected. While traveling north from Georgia with the grandkids we were looking for a for a stay approximately 5 hours from the Lewes- Cape May NJ ferry. This motel is quick access to I-95 so for location it couldn't be any better. We got a room with two queen size beds that was ample in size. The major negative was the carpeting was in need of a good shampooing. If not for this I would have given it 4-stars. The drive from Augusta to Annapolis is too much for us and our two dogs, so we stop at a motel on the way home. We'd been stopping at a motel in Petersburg, but this time decided to try a different place. The location of the Best Western is excellent. It's adjacent to several gas stations, convenience stores, and restaurants Across the road there are even more restaurants to try. The room itself was roomy and comfortable with two queen beds and a chair with Ottoman. There was also a small microwave, a mini fridge, and an iron. The beds weren't luxurious but comfortable enough for us to get a restful sleep for the night. In the morning the free breakfast is a welcome extra. Our stay was quiet with the dogs seldom having any excuse to bark. All staff were very friendly and courteous. Our toilet stopped up once. When I went to the office to ask for the plunger, the lady immediately gave me one and apologized profusely. After the one plunge there were no more problems. The bathroom is small but nice. There was no fan in the bathroom We'll be stopping here again on our next trip. We decided to stay at the Emporia Best Western mostly because of its location and positive experience with other Best Westerns. The facilities located within walking distance are terrific. It's a very quiet motel with very friendly and helpful staff. Its not the Ritz, but we were very pleased with the accomodations. "took care of problem but that's it"
Told us when we called hours in advance they only had one room left. When we arrived they offered us 1st or 2nd floor. We chose 2nd floor when we went to the room the a/c didn't work . Put us in another room...thought they only had one room left? Otherwise so so B/W place needs update. o.k. for a night. We checked on May 27-30 on vacation. The rooms were nice, breakfast was good and the most part the staff was friendly. But when I asked who appeared to be the head housekeeper for "2" towels it obviously was a problem because she ignored me and walked away. If I'm not mistaken the name on her tag read "Lucille". But another housekeeper stepped in and was very helpful. Overall it was a nice stay but next time we might just bring our own towels. Maybe the owner should have a talk with management about better customer service. "Fine for a pit stop"
We stopped here for a quick stay on our way to North Carolina. We chose it because we could stay there with our dog. The room was tidy and clean, and adequate for our purposes. However, it had a dog odor, the room felt musty and the bathroom was small. Fine for someone traveling with a pet. This is a clean, comfortable hotel. If you're heading south stop here for the night. Beds comfortable, rooms clean. Breakfast good. Restaurants close by gas,stations. Quiet area. Going to stop here on way home. We have been staying at this Best Western for quite a few years. 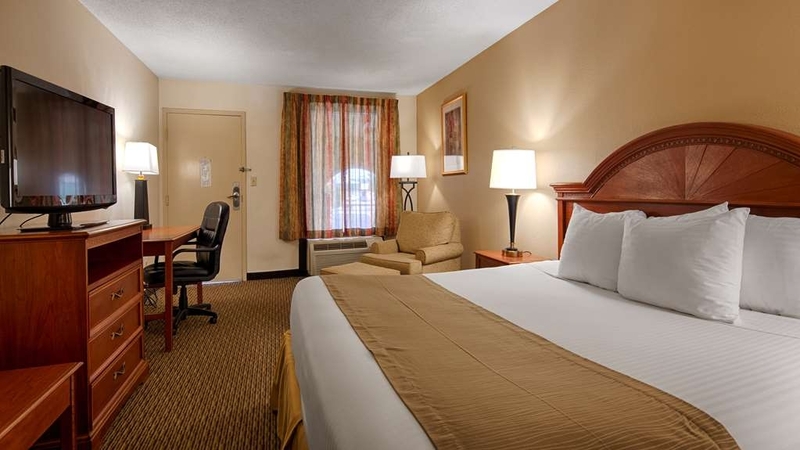 We stay whenever we are traveling to NY for family events, and we have always been very happy with the employees as well as with the quality of the rooms. This is also a pet-friendly business which also appealed to us for many years. Not for the fussy. Basic clean room for an inexpensive overnight conveniently located on the I-95 corridor. Gas stations and restaurants closeby. They have breakfast included, but we are on the road before its available. Ice, refrigerator, pool, wifi. I've stayed at many Best Westerns along the east coast, this one how ever was not the best or even up to par with the others. Hotel needs a major face lift, old, tired and shabby. Carpet was dirty and needs at minimum a cleaning, really should be replaced. never once put my bare feet on it. Breakfast was lackluster to say the least. Employees were friendly and helpful. "Great Place to say when you are on vacation"
Our choice of motel is always the Best Western in Emporia, Va when we travel to and from Florida. Where else can you get a wonderfully clean and modern room with an awesome bed, and breakfast, too, for $71.99 plus tax. None better! I stayed at this hotel for approx. 3 weeks and found it comfortable and safe. The breakfast was always hot and very good. I would recommend this hotel to anyone, it was clean and comfortable. Staff was very courteous and helpful in every way. They would go out of there way to make sure I was comfortable. I will definitely stay here again if my travels bring me through. 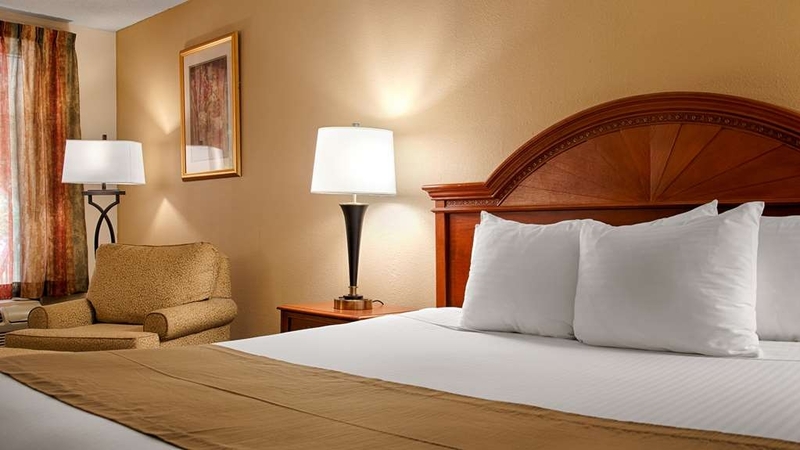 "Best Western is my hotel of choice when possible"
This hotel was not only well within our price range for the area, it was extremely clean, had all the amenities you would look for and the staff were ALL happy, helpful and knowledgeable. I would recommend this hotel to everyone! A pleasant place to stay. Very nice staff. Internet worked great.Room was comfortable, clean and quiet. Located right off I-95. A Shoney's right across the street. Have stayed here before on my way to vacation and would stay here again. we do a lot of traveling for pleasure, we always look for a Best Western hotel and will go a few extra miles to get to one. Only time we do not use Best Western is if there is none close by. We had to stay in two other motels this trip and they just do not measure up for price and service!! The room was exceptionally clean. Nice. So, we "thought" when we woke up the breakfast would be from good to great as well. WRONG. Not one bite was good enough to eat. If we "could have had" the waffles, it might have been okay. But dietary restrictions limited our choices to the scrambled eggs and sausage: both of which tasted "fake" to say the least! "Great hotel for quick stop from i95." For those traveling between NE such as NY, NJ, CT etc. this is a great stop heading to and from FL. The hotel is literally within distance from i95. Great rate, super clean room without smell, good quick hot breakfast to get you started. Staff were also great. Not fancy but my family felt comfortable and safe at this stop. "Nice, Easy Stop along route 95"
We arrived late in the evening on our way down 95. We had stopped at this rest area the last time, but chose a different chain. We were very satisfied with the service at the late hour. The bed was the most comfortable bed I've ever had in a highway hotel. My boyfriend and I tried to stop here on our way back from Florida. DO NOT STAY HERE. The lobby wasn't open at 12am and there was a random guy near us being strange as we checked in. We got to our room and the door barely opened and then it barely locked from the inside. We left and got a refund. Not a good area or place to stay at. Needed a place near 95. This was right off the exit. Lobby nice and clean and checkin was very fast. Room was clean and beds comfortable. No whacky smells. Breakfast was good with plenty of hot and cold choices. I would stay here again especially for the nearness to 95. This hotel was clean but rather run down. Had we known that there was no elevator and that the rooms all opened to the outside, we would not have stayed here. The noise woke us up at 5:30 and continued non stop. Our room door, which oped out onto ground level did not close properly. Traveling up and down I-95 from CT to FL is a long trip. We stayed at this Best Western one night. It was reasonably priced, very clean, and had a friendly staff. Breakfast in the morning is included in the price which is a big plus. I will definitely stay here again in the future. My son and I were taking a trip and I knew we'd need to stop over and get some rest. I reserved this room via the website and turns out it was the best decision ever. Nice and quiet. Bed slept like a dream and our waffles at breakfast were pretty tasty too. Comfortable hotel--easy access to I-95--pleased this hotel was selected for this trip stop over.Will probably select this hotel on future trips southbound. This was first experience with the Best Western Hotel grouping, will not hesitate to use them again. "Good stopping point from NH to FL"
We are so glad we chose this hotel. It was very clean and modern and right off 95 in a quiet area. There is a Shoney's across the street with a great salad bar. Emporia is the perfect midway point if you are traveling from New England to Florida. Hotel was clean and comfortable. Beds were comfortable and had a good nights rest. Breakfast was good and not bad food selection. I would stay here again. I would definitely recommend this hotel to my friends. The room was overpriced for what was provided. The door handle didn't open the door without a lot of wiggling and jiggling to get the door to open. The water pressure in the shower was very poor. The toilet didn't flush properly and barely went down after several flushes. The closet door rubbed on the carpet and wouldn't open or close without forcing it hard. Good location off Interstate 95, Clean rooms and good breakfast. Fast Internet access. Very friendly and efficient staff. Very comfort sleeping accommodation with good amenities. Should definitely stay there again and recommend the Hotel to others. This is an older hotel, with no accessible parking near the office door, a limited breakfast bar and very small, dated rooms....Staff were all great but everything else, in the hotel needs an upgrade. I would not stay here again, nor would I recommend it, when there are comparably priced hotels nearby, that are much nicer. Frontdesk cleck wasn't welcoming, breakfast awful but cleck in morning room gave good service and smile, room was ok but old fashion comfort, modern tv...bathroom ok but not great. One of the worst Best Western I've ever visited. best western is my favorite for pet friendly hotels because it is clean, roomy and comfortable while still allowing pets. also quiet and in good neighborhoods. thanks for the excellent service and pet friendly environment. also, great free breakfast saved us about $20/ day. We had travelled a long way and were just coming off Interstate when we saw the sign. Pouring rain made our drive a lot more stressful than usual. This hotel was just fine. We had nice comfy beds and it was neat and clean. Mary at the front desk was very pleasant to us. Didn't sample the breakfast as we left early. All in all it was just what we needed for a quick overnight stay on the way to Florida. Used my points for a free night. Room was ok except that bi-fold door on closet was not adjusted correctly and would not open. Shower control had a major leak and spurted water straight out of the control and this made the shower itself weak. Beds were very comfortable but pillows were awful. Luckily I had my own pillow from home. My wife did not and she was very unhappy with the pillows.Breakfast was very good with a great variety of items to eat and drink. Hotel is right off I-95 and easy to get to. Several restaurants nearby and also a shopping center with a food market. Very quiet location. "So close to I-81, easy on/easy off"
Glad we chose this motel. So easy to find. We were given a room in the back. We are seniors too and, like the other person who reviewed said, we like being able to park right outside the room. The room was quiet, had lots of room, good internet access, and was clean. The free breakfast was in the lobby and it exceeded our expectations by even having scrambled eggs, sausages and make your own waffles. A lady was looking after it and she was doing a good job seeing that things were full. The only thing that could have been better was the coffee. Nothing fancy but clean and very quiet. We prefer hotels/motels that we can drive right up to our door as we're both older adults and it's much easier to unload and reload our car without dragging things through a lobby, into an elevator and down a hall. We found the beds comfortable, the bathroom was spotlessly clean. Would definitely recommend, especially for those who still like this type of motel. We wish more chains would bring these types back. This particular hotel was clean, no repairs were needed and the staff was courteous and very helpful. The breakfast was good and always kept fresh and filled. Will stop here again! We are seniors and the front desk person made sure that our room was easy to get to and the breakfast lady was spectacular! We were not satisfied with this hotel due to the fact that when my husband, children and I went to lay down a roach ran across the nightstand and we don't know if there were more. Because of that we were disgusted and couldn't sleep. We still had another 5 hours to drive to complete our trip so it was extremely aggravating to get no sleep. The appearance wasn't so great either. Never again! Especially for that price! Was a good stay overall. As expected for the reasonable price. We arrived late, tired from driving all day. The staff was professional and welcoming. The room was clean and well equipped. Continental breakfast the next morning was not great but adequate, made much better by a super friendly older lady with a charming southern accent that was constantly making sure everything was stocked and checking on the guests to fill our coffee. We were traveling home from a Florida vacation and saw the sign for this Best Western. We are members of the Best Western Club and usually stay at a Best Western Plus or Premier hotel. This is their bottom tier hotel. 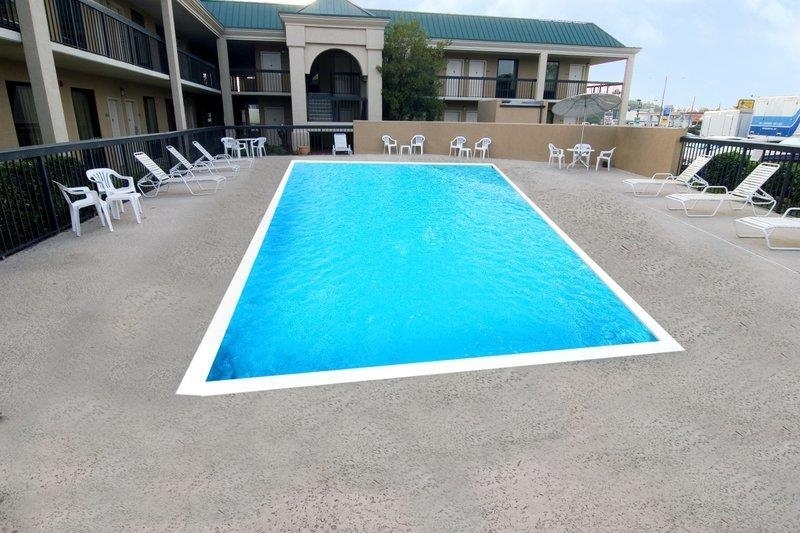 The staff was friendly and helpful and the hotel was very clean but dated. I would consider it average. We got off the road from a long day of traveling and it was fine for one night. The beds were very hard and my wife and I did not sleep well on them. I would tell them to consider new mattresses for comfort. They served a full breakfast in the morning which was good and what we expected. I would not consider it for an extended stay. We stayed 1 night Nov 16, 2016 Easy on & off 95. Room was clean, bed was comfortable. There were several restaurants nearby.Being on a main road it was a little noisy but OK. The Breakfast was good large variety of selections. Staff was courteous. Only complaint was the door to the room was hard to operate had to swipe the card a few times & my husband had to push hard to open & close. I ALWAYS try to find a Best Western when traveling and need a place to spend the night. The reason I do this, is because I know the rooms will be clean, the breakfast will be good and the wifi is free. Everyone is always helpful and nice too! Why chance stopping just anywhere when I can stop at a Best Western and be confident of the value and cleanliness! Just as before, we found a clean spacious room. The bed was very comfortable. Everything was in good condition and good working order, with all courtesy supplies available. We had a delicious breakfast, with fresh ingredients. All this at a reasonable price. This is the second time we stayed here, and we will definitely do so again. The hotel is located right off I-95 which is ideal for us. Good overnight stop. Room was clean and comfortable bed. Liked the parking in front of room. HBO channel didn't work. Staff very accommodating with special request for room on lst floor and parking in front. Breakfast was ok - nothing special. Great value - easy on easy off of 95 with nice rooms great beds and a good selection for breakfast. internet worked well and there was a great work table in the room for me to work. The room was very clean with plenty of new towels and had one of the biggest refrigerators I have seen in a Best western. Shared my room with my elderly parents who were seasoned travelers as well and for the price it was perfect for our half way point to our Savannah trip. Exterior and the landscaping were very well maintained and the staff were Very friendly. "Worst Best Western ever !" Thank you for taking the time to write a review of your stay. I apologize for the issues you encountered while staying with us. We are always looking to improve and reviews help with this. I hope that you would consider staying with us again. If you would like to speak to me about your stay please call me @4346343200. Glad you enjoyed your stay. Hope you will return again!! Desk staff more concerned with their personal phone calls than with answering questions. Traffic noise was bad at night. Not up to a Best Western quality. 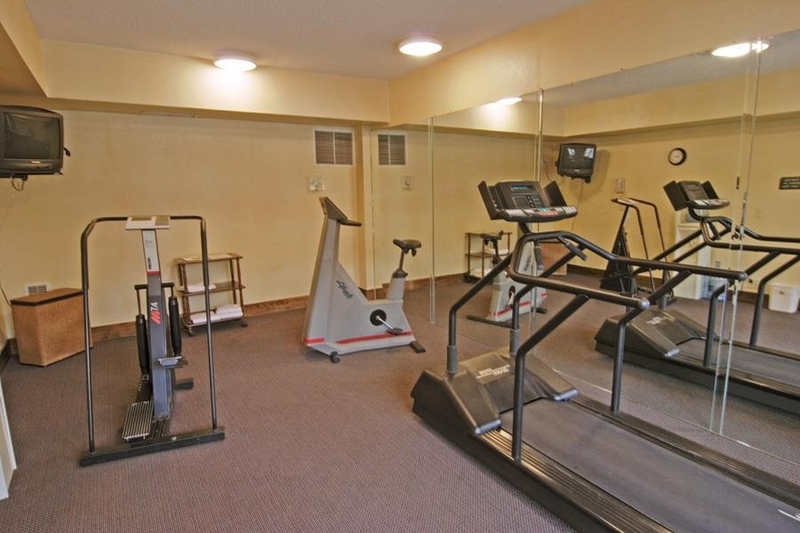 The fitness room was the only good thing about the hotel. Thanks for taking the time to write a review. I apologize for the issues during your stay. It is my hope that you will return again and give us another chance. If you would like to speak to me about your stay please contact me @4346343200. Great Location at a Great Price. Really easy to book hotel thru their mobile app. Was impressed with how clean, and how large the rooms were. Pet Friendly. Hotel is modern and updated. Highly recommend this hotel. So glad you enjoyed your stay!! Thanks for taking the time to write a review!! spend the extra $25 and go somewhere else. We had 3 rooms they were clean but the beds are terrible. the 1/2 pillows are a terrible idea. they must have sprayed a bottle of air freshener in the room to cover what smell?? had ti fix the sink drain also.for a Best Western I expected a lot more. Nice sized room with 2 comfortable queen beds and multiple pillows. The location has pluses and minuses. It is convenient to I-95, but all the rooms face and are somewhat close to US 58, which is busy and noisy (with trucks) until about 11PM. Noise resumes about 6:30AM, but we were up and ready for the free breakfast. Breakfast was good enough, but I've had better choices at some other hotels. Overall, this was a satisfactory hotel for an unplanned and unreserved overnight stay. A coupon in a rest area guide made the cost $60.95 (plus tax). "Recently Renovated - good Bang for the buck"
The facility was recently renovated and my room was in great condition and clean. The front desk staff made check in and check a breeze. 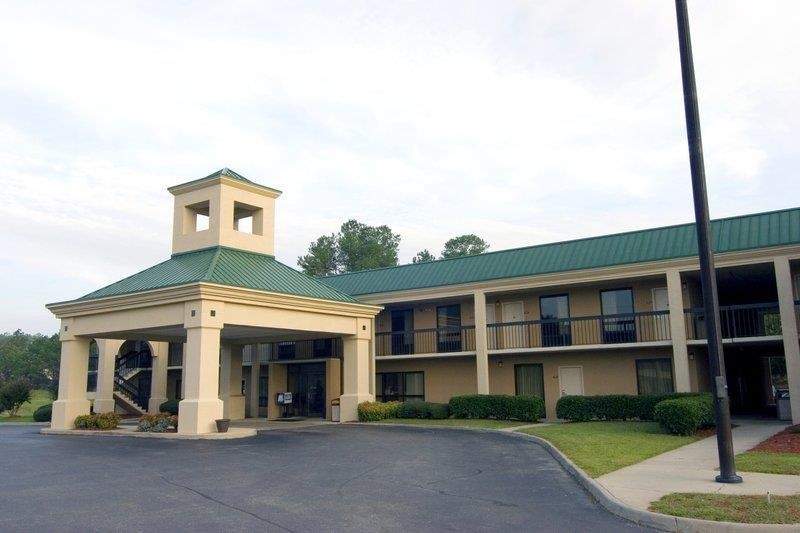 The hotel is located close to restaurants and just off of the Interstate for convenience when traveling. great hotel with a great staff. I enjoy staying at this hotel when im in this area. Really nice size rooms and real comfortable beds. i recommend this hotel to all. great breakfast and short a walk to some great restaurants. This was the nastiest, dirtiest hotel I have ever stayed at. The room smelled like mold and mildew. The furniture was so stained and scuzzy I had to cover it with the bedding before I could even sit down. I found several species of bugs in the room and bathroom which was in need of a good scrubbing to remove the black mildew..it was disgusting! The only reason I did not leave was that my elderly father was settled into the handicapped room next door. Oh - did I mention the non-existing wi-FI? Or rooms stocked with decaf coffee only?